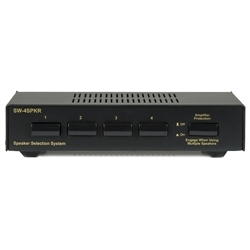 The SW-4SPKR is designed to allow up to 4 pairs (SW-8SPKR allows up to 8 pairs) of 8 ohm speakers to be connected to a stereo amplifier or receiver without damaging the amplifier. These devices also function as “Switching Stations” to control all the speakers in a multi-room system from a central location. The buttons are used to turn the individual pairs of speakers ON & OFF. To maintain individual volume control over each pair of speakers, heavy duty “Autoformer” type volume controls should be used (1 for each pair of speakers). These volume controls must be located, in-line, between the SW-4SPKR or SW-8SPKR and each speaker pair. Wiring from the amplifier to the SW-4SPKR and SW-8SPKR should be a minimum of 18 gauge. If wire is to be run through walls, it should be “CL” rated. For runs over 100 feet 14 gauge wire may be used. 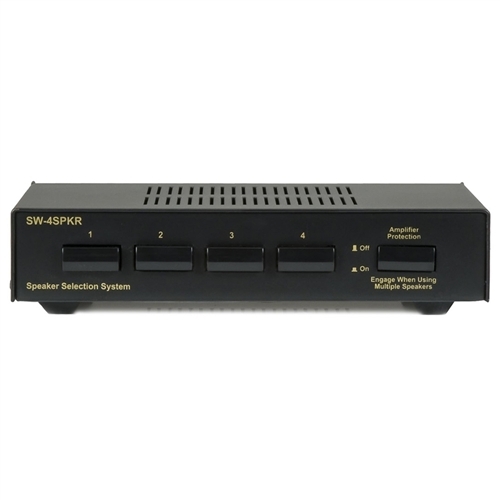 This device functions as a “Switching Station” to control all the speakers in a multi-room system from a central location.